With the threat of space debris destroying satellites, crewed spacecraft and even the International Space Station increasing, processes have been initiated to help alleviate and prevent this threat. NASA’s new Administrator Jim Bridenstine made several statements about the new Space Policy Directive-3, which was signed by President Trump.During the June 18, 2018, meeting of the National Space Council, Trump signed SPD-3, which directs the U.S. to lead the management of space traffic and mitigate the effects of space debris. 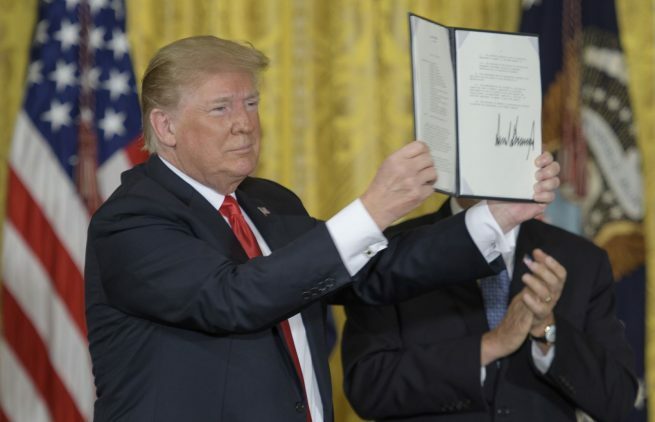 This comes less than a month after the signing of SPD-2, which called for the reform of the United States’ commercial space regulatory framework. Additionally, SPD-1 was signed in December 2017, which instructed NASA to return U.S. astronauts to the Moon with the eventual goal of human flights to Mars. “SPD-3 builds on our continued progress implementing SPD-1, which is galvanizing American space leadership by returning to the Moon with commercial and international partners, and SPD-2, which will create regulatory certainty for entrepreneurs to raise capital to grow the American economy in space,” Bridenstine said. One of the main features of SPD-3 is the management of space debris. It calls for the U.S. to utilize government and commercial technologies to track and monitor debris and set new guidelines for satellite for satellite design and operation. Additionally, it calls for the update of the U.S. government’s Orbital Debris Mitigation Standard Practices, which currently states that spacecraft and upper stages should be designed to eliminate or minimize debris released during normal operations. Additionally, any debris larger than five millimeters that is expected to remain in orbit for more than 25 years is to be justified on the basis of cost and mission requirements. The directive sets guidelines for the management of space traffic. In particular, the U.S. should provide basic space situational awareness data and space traffic management services “free of direct user fees.” Moreover, the Department of Commerce is called on to make space safety data and services publicly available. “Reducing the growing threat of orbital debris is in the interest of all nations, and NASA looks forward to working with the National Space Council, the Department of Commerce and other partners on a path forward,” Bridenstine said. Reusable, efficient, and super high Isp Space Tugs with Electric Space Propulsion Systems with an Isp between 2,800 and 14,000+ could be quite useful in consolidating and recycling or clearing space debris in various Earth Orbits and in enabling the use of Lunar, asteroid, and Martian resources for the building of space based solar power systems. Massive amounts of clean and green energy are needed on Earth to help decarbonize our atmosphere. Space based solar power systems could help to provide some of that zero CO2 producing energy. We are killing off 7 million people a year with dirty air, and that annual killing rate is about the same annual human kill rate that we had during an average year of World War II. We are at war with dirty air and global warming and we need to get real serious about winning that massive war. Yep, an international “Moon Village” with robots and folks doing “resource identification and extraction” could help to reduce both the risks and costs of deep space exploration and colonization while enabling useful space based solar power systems for the Earth, Moon, Mars, and Ceres. The Moon Village and Lunar resources should also help us to “to grow the American economy in space” and contribute to the scientific, technological, and economic growth of countries all across the Home Planet.